Seegatesite.com – maybe you currently wondered why google adsense earnings are low enough. 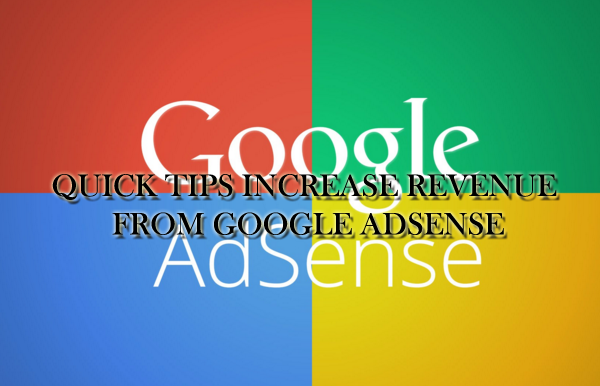 As a beginner you don’t notice some important strategies to increase revenue from Google Adsense. Google Adsense is still the top choice for many bloggers to make money from blogs. The main reason, google adsense a great company and reliable, so many big advertisers who market their products through adsense, the acquisition of which was obtained by the publisher is promising. This is also the reason why so many people are looking for tips and the best strategies to increase revenue from Google Adsense all the time. How To Increase Traffic to Website With Search Query Optimization. And although there are quite a lot of Adsense alternative, but when done correctly, Adsense alone can provide large enough passive income with minimal effort (after the website you reach a point certain circumstances). This is the basis or foundation requirements to successfully achieve commensurate results from Google Adsense. Many novice bloggers just focus on improving traffic. They use every means to increase blog traffic, but most don’t work effectively. So they failed in both, increase blog traffic and Adsense income! If you are one of them, stop!. Because what you did was wrong. To increase revenue from Google Adsense (especially for new blog), all you need is quality content. What does it mean by Content Is King? Content is what makes a blog successful. Almost all the great blog you visit, always full of great content. Their content is what makes you (and others) continue to visit there. How do I create a rich content’s blog? 1. Discover content on a topic in which you worked. 2. Determined to write consistently and in large quantities. 3. Promote your content to the right target audience. – Preferred and rank better in the search engines, especially Google. – Increase the average time of the visit, and at the same time decrease the bounce rate. Both of these are automatically also will help your blog rank better in search engines. – People will begin quoting, giving a link and share your content voluntarily. It makes your blog will also get traffic from other blogs. As the start of any attempt to increase your Adsense revenue is to create quality content and in large quantities consistently. There is no more any strategy will succeed without this main foundation. The Adsense rules allow you to install 3 banner units, 3 link units and 2 units of the search box on every page. If you just install everything, sometimes it will not work. Due to disrupt the convenience of readers, they will most likely never click on your ads. If you want to increase revenue from Google Adsense, you have to want to do the test. Experiment of the various aspects of ad units, starting from the position, size, style ad, colors, fonts and so on. Each blog has a typical that is different, of course with google adsense ads on your settings. 4. Design and ease of navigation. Because no matter how great the content you have, if the design blog difficult to find it, then everything will be in vain. Place your ad was in a position corresponding to the size of your website theme. Optimizing the color advertisements (text links, backgrounds and borders), is an easy way to increase CTR. Adjust the color of links and background to blend with the overall design of your blog. In terms of Adsense optimization, use of responsive ad units that will adjust the size based on the size of the user’s screen. If not, then you missed a great opportunity to increase your Adsense income. Hopefully the above tips can increase revenue from google adsense.